Pioneers in the industry, we offer electronic type oval gear flow meter, mechanical type oval gear flow meter, digital type diesel flow meter, mechanical flow meter with pulse output and diesel flow meter from India. The Electronics type Flow Meter is compact design, high performance, reliability, accuracy (Up to 0.5% accuracy). It has Low pressure drop. Widely used in industries of petroleum, chemical processing, medicine, transportation food etc. High precision, durable and compact turbine flow meters. Lightweight, compact design allows for easy installation. Powered by Lithium batteries for approximately 9,000 hours. Line Size 1" - 2"
Mechanical type Oval Gear Flow Meter is a kind of positive displacement Meter to measure the liquid flow or instantaneous flow of the Pipe tube. It is a kind accumulate meter with reset option. It is used to measure flow of fuel like kerosene, diesel petrol & oil kind liquid but is forbidden to measure corrosive liquid. 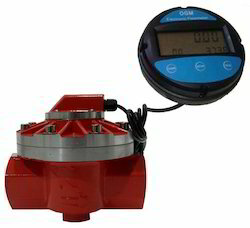 Line Size 1" to 2"
The Mechanical type Oval gear flow meter has pulse output which is connected with electronics display. While emphasizing on diversified needs of the clients, we have been indulged in providing Diesel Flow Meter which is developed in compliance with industrial standards. Applicable in the automobile industry, this offered Digital type Diesel Flow Meter is made available in various specifications as per the needs of the clients. It is suitable for high viscosity liquids. Register cap can be easily removed and rotated to every 90º orientation for display reading. Mechanical type Oval Gear Flow Meter is a kind of positive displacement Meter to measure the liquid flow or instantaneous flow of the Pipe tube. These products are precisely engineered which are widely used for various application areas like petroleum, petrochemical & process control industries. Our products are ideal for fitting into tanks or process vessels so as to control the levels of the liquids preventing the overflow of the tanks. 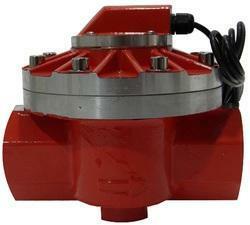 Low pressure drop allows for gravity and pump (in-line) applications. 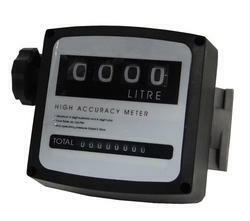 Fuel Meter are exceptionally intended to quantify quick exchange of petroleum based liquids, for example, gas (petrol), diesel, lamp fuel, light oils and solvents.